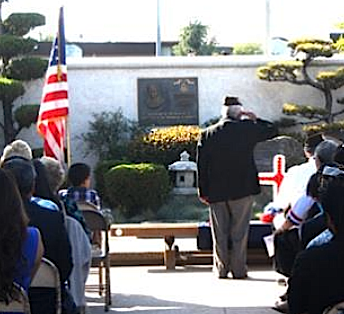 PACOIMA — A Memorial Day service will be held in honor of the deceased veterans of the San Fernando Valley on Sunday, May 27, at 5 p.m. in the courtyard of the San Fernando Valley Japanese American Community Center, 12953 Branford St. in Pacoima. All community center organizations, families of deceased veterans listed on the memorial, all veterans and the community are invited to observe this event. SFV community members are asked to submit names of deceased veterans so that their names may be inscribed on the memorials located in the Kiyoshi Muranaga Veterans Memorial Garden. Qualifications include service in any branch of the armed services at any time in war or peace, and any family member must be a resident of the San Fernando Valley. A light dinner will be served in the Dr. Sanbo Sakaguchi Memorial Hall following the service. Donations and remembrances should be made payable to SFVJACC-Veterans Fund.